possible as a first jump! 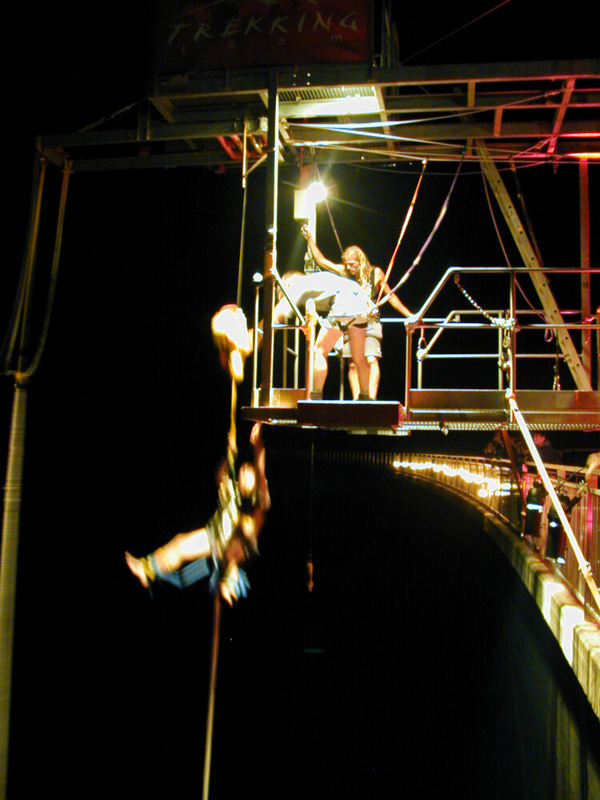 It’s our original Bungy jump with added intensity! Our Bungy site is only minimally lit with candles and chains of lights – it’s only you and the night sky… and hopefully some stars. A magic atmosphere for Bungy jumpers and spectators alike. You will be briefed and carefully walked and talked through the whole jumping process. 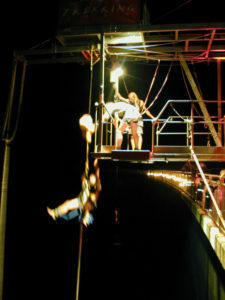 After completion of your Bungy jump you will receive a jump certificate. Availability: The night jumps take place on the following dates: Thursday August 15, 2019 and Saturday September 14, 2019 from 21.40h. For groups of a minimum of 10 jumpers we can organise a special night jump event, however no group discounts for special openings. Weather: For night jumps we need fair weather conditions! There can be last minute changes or cancellations due to thunder storms and such. Please remain flexible. For last minute informations call Tel. +41 796 007 007. Meeting point: Directly on the Verzasca dam, roughly 10 mins before your jumping time. For registration, training and jump you have to allow approx 30-45 minutes. The jump itself will take about 5 minutes. The Bungy jumping site on the Verzasca dam is open seasonal, from the Easter weekend through to the end of October every Saturday and Sunday afternoons. During the summer school holidays in July and August we are open from Wednesday through to Sunday, afternoons. For groups of 5 persons and more we can organise special openings during the above mentioned season. For night jumps we require a minimum of 10 jumpers. Please note that there are no discounts (group, student, youth etc.) for special openings. General health requirements: The jumper needs to be in a good and healthy physical condition. Participants with the following health conditions are explicitly excluded from bungy jumping: Pregnant women, people with high blood pressure, heart disorders, epilepsy, damage to the musculoskeletal system, neurological disorders, glaucoma, ocular hypertension, chronic ear ailments with disturbance of equilibrium. Furthermore the jumper must not be under the influence of alcohol, drugs or mind-altering medication. Please refer to your doctor before you book a jump if you're taking medication or are insecure about whether you are fit to do a bungy jump or not. You will be signing a liability release before your jump. Age / necessary documents: There is no minimum age for Bungy jumping but the minimum weight is a requirement. Participants under the legal age of 18 years need the signed declaration of consent from a parent. Bungy jumpers over 65 years of age please bring a medical statement that you are fit for the jump. The 007 Bungy site is situated on the Verzasca dam in the canton of Ticino, southern Switzerland. The artificial lake is the Lago die Vogorno. Your next bigger towns are Locarno or also Bellinzona. The dam belongs to the commune of Gordola with the postal code 6596. Once you reach Gordola, remain on the main road until you see the turn off into the Valle Verzasca. Take that turn off and continue on the Via Valle Verzasca until you see the immense dam after about 2km. 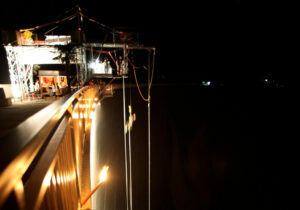 The Bungy site is situated in the middle on top of the dam. There's a parking lot. The bus also stops next to the parking lot and is called "Diga Verzasca". Arriving by plane: The closest airports are either Zürich (Switzerland) or Milan (Italy). The journey by (rental) car takes roughly 3 hours from Zürich Airport and about 2 hours from Milan. We recommend to allow for more travel time during peak season in summer. Train & bus from Zürich will take about 3 hours and from Milan roughly 4 hours. Arriving by train/bus: Depending on where you travel from you'll either catch the bus in Tenero or Locarno. From there it's a bus ride via Gordola and up the valley (bus 321 direction Sonogno) to your final destination "Diga Verzasca". If you travel by public transport we recommend to book one of the following jumping times: 13h00 (except Sundays) or 16h00. There are a few more busses during peak season in summer. So best check your timetable and book your jump accordingly. The bus stop is 5 minutes from the site. Click here for Timetable Swiss trains and busses (Destination „Diga Verzasca"). Choose the region "Lago Maggiore and valley" and pick your accomodation or camping in the region of Ascona and Locarno (20-25 mins to the Verzasca dam). Both places are close or directly at the lake where you'll find lots of restaurants, bars. Check out as well the numerous festivals in the summer! What's the height of the 007 Bungy jump? The dam is 220m - jumps are always measured from top to ground/water; the jump itself is a safe distance away from the bottom. What jumps are possible? Can we do Tandem jumps? Tandems are not possible on the dam.To spice up your jumping experience - from the 2nd jump onwards you can do backwards jumps and from the third (at very earliest) the Ultimo jump (reservation for the latter MANDATORY). It's the jump master's decision whether a special jump is doable or not (experience, weather etc.). Highly recommended to avoid disappointment over long waiting hours (for everybody!). Plus you want to make sure we're there if you come from far away. Here's the link to book online. Do I have to pay the jump in advance? We recommend to book and pay over our Online Booking Platform. In any case we'll need your credit card details as a guarantee in order to make the booking and you can also pay on site in cash, CHF or EUR (or credit card). For group reservations we need a 25% prepayment and a credit card guarantee for the remaining bookings. WHY? We have to plan ahead, we need to organise staff etc. There are terms & conditions and cancellations policies - please read them carefully - they apply for every booking. Can I jump when it rains or in bad weather? Yes, you can!We cannot jump when the dam overflows (happens only very rarely but we have to abide by the directives of the Verzasca SA). We cannot jump with thunderstorms & lightning (the latter being the problem, not the rain) and thick fog. However this is usually a matter of time - thunderstorms and fog usually pass and we can resume Bungy jumping. Can I jump with my glasses or contact lenses? Yes for contact lenses; no for the glasses unless you bring a strap or a pair of goggles that can be attached to your harness. But be aware that we cannot be held liable for any loss or damage to your glasses. Are there special health requirements? 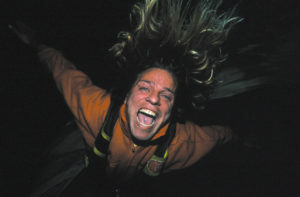 Participants with the following health conditions are explicitly excluded from bungy jumping: Pregnant women, people with high blood pressure, heart disorders, epilepsy, damage to the musculoskeletal system, neurological disorders, recent eye surgery, ocular hypertension, chronic ear ailments with disturbance of equilibrium. With your signature on the registration form you confirm to be of good health and have no ailments that could be problematic with Bungy jumping. Is there a min and max weight? The minimum weight is 45 kg, the maximum weight 115 kg. No, it's not, if you abide by all instructions and directions of the Bungy team. It's comparable with any other outdoor activity like hiking, biking, surfing etc. 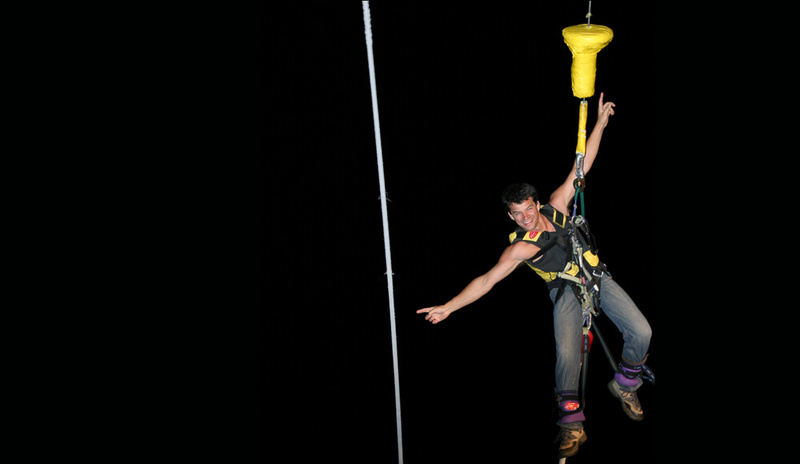 From registration to completion of your Bungy jump allow roughly 45 minutes. What's the procedure? What do I need to do? Once you arrive at the reception trailer you fill in your registration form, do the payment, then we check your weight, get rid of everything in your pockets (car keys and such! ), we give you further infos, get your harness, do a jump training and once we're all ready to go you'll be called up to the platform for the jump. One you're back from the jump - go get a drink and your certificate at the registration trailer. Can I cancel my jump? No! It'll be costly - here's why: Please read our cancellation policy Annullationsbestimmungen. 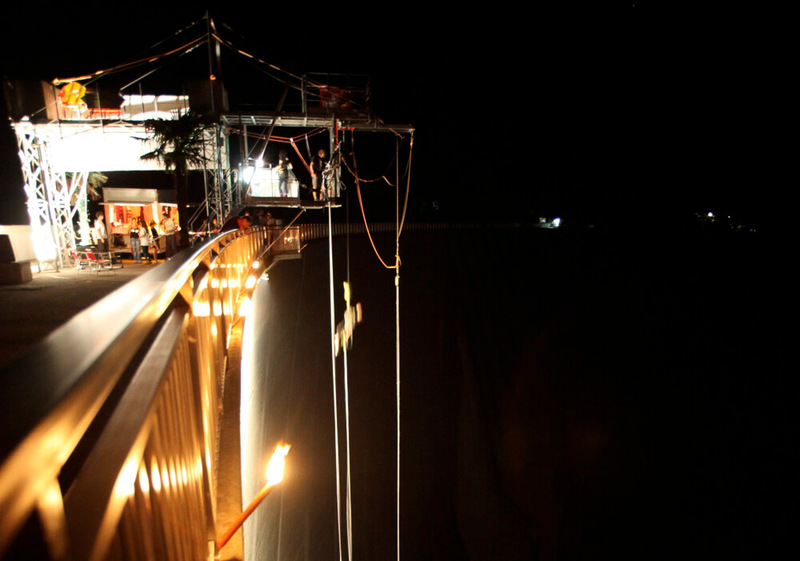 Once you book your jump - you step into a binding contract with a provider of an activity - that's us.And for last minute fears: We do understand that that the dam is high and impressive. But that's why you came here in the first place! It's not a walk through the park but you could do that any day and anyone can do that, right? You came here for something special, you made your mind up - so go for it! You'll love it, it'll be fun and you're allowed to be totally proud of yourself for doing it! Bungy jumping is comparable with any other outdoor activity such as biking, surfing, hiking etc. As long as all instructions and directions given by our jump masters are being carefully followed, there's really no need to worry. The regulations in Switzerland for companies offering outdoor activities are very strict. We abide by the rules of the Swiss Outdoor Association as well as the safety lable "Safety in Adventures". Trekking Team AG was a foundation member and is member of the board of the Swiss Outdoor Association defining standards of safety, training and certification of outdoor guides in various fields, especially Bungy jump masters and specialists. The „Safety in Adventure„ foundation is an NPO. They define the safety requirements and regulations and the strict compliance of such by conducting audits on a regular basis. These guys rule! I just did the 220 meter James Bond 007 GoldenEye jump and it was an unforgettable experience. These guys use the best gear, have the best vibes and make it a good time! I jumped while Beck - Loser was playing in the back and came up to Queen - Bohemian Rhapsody! Highly recommend this team and company to give you that adrenaline fix you crave. Doctor's orders! Best experience ever! Definitely worth the price! Amazing views and staff is amazing! Just do it!